Sometimes, it’s just nice to go back to the classics. The constant march forward isn’t without its stumbling blocks, and whether for the sake of nostalgia or greater good, sometimes you have to take a step back and embrace the good, old ways that used to govern things. Double Stacks by NetEnt tends to narrowly walk that line, presenting the old fruit machine idea with a fresh, 2018 coat of paint. 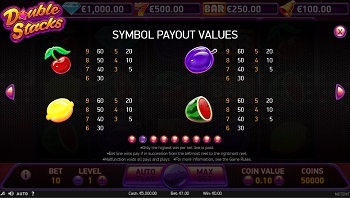 The title has stacked symbols which can appear as double on the same reel, allowing one icon to count as two, not to mention a rather lucrative free spins bonus that’s available to players. You will find lower paying icons like the melon, lemon, plum and cherry, as well as higher paying ones like the bell, a bar, a lucky seven and a diamond. A silver-blue circle is the Scatter, while a bright gold star is a Wild. NetEnt is one of the giants of online gambling, setting their mark on the industry at its infancy, and has continued to grow and succeed ever since. They have been a pioneer in pushing the market forward with awesome titles powered by their cutting-edge technology – always staying ahead of the pack and experimenting with how far they can push the graphics, and what sort of different gameplay they can create as a result. The Swedish studio is responsible for famous releases like Gonzo’s Quest, Starburst and Jack Hammer, and their titles continue to be among the most popular video slot releases each time one drops. Double Stacks uses a colourful 5×3 playing field with 10 fixed paylines that pay only left to right. This means that players can only adjust their bet level and coin value, allowing them to set their wagers from $0.10 up to $200 per spin, giving everyone from casual gamblers to high rollers who like to bet big and win bigger an option to enjoy this NetEnt releases to their specific liking. Never one to lag behind in any area, NetEnt also has a rather extensive Autoplay option, allowing you to select how many spins you want to play, as well as stopping Autoplay on any win, or just if free spins are activated, and even if a single win exceeds your expectations, or your cash amount increases or decreases past a certain limit. The slot doesn’t particularly go overboard on the graphics. The afterglow of the symbols is a nice touch, and a few small effects on top of the reels and in the backdrop make it easy on the eyes, but it’s not going to sweep you off your feet. If there’s one thing you can rely on NetEnt to provide, it’s some top tier visuals, and they have yet to disappoint our expectations. 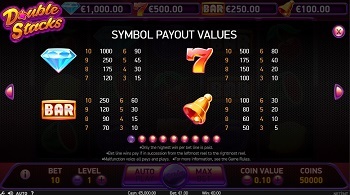 The four high paying symbols – the bell, the bar, lucky sevens and the diamond, can appear stacked on the reels during normal gameplay. When a reel is completely covered in just one symbol, that reel doubles – the icons on said reel, for that turn, count as if there are two of them, allowing players to net bigger wins by winning on paylines with these double symbols. The second bonus available is the free spins special feature. 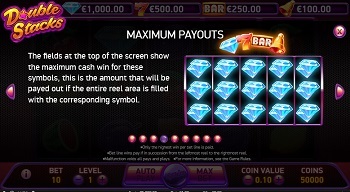 Collecting three, four or five Scatters will reward five, fifteen or thirty free spins, respectively. While this bonus is active, in addition to the above mentioned four symbols, Wild symbols can also appear stacked. 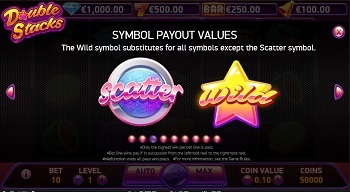 It is possible to retrigger the feature to win additional free spins, and you need to collect two or more Scatters while the feature is active. 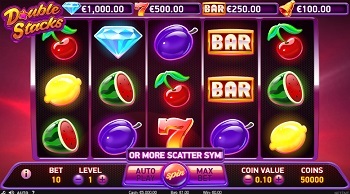 For two, three, four or five Scatters, you are rewarded with two, five, fifteen or thirty extra free spins, respectively. What’s nice about this NetEnt release is that it says exactly on the tin what you can expect from it in terms of cash prizes. The top four wins are always listed on the top fields above the reel, and the biggest you can get is a 1000x win for a ten-of-a-kind diamond win. The title is a medium volatility game with an RTP of 96.1%, which sits above average for video slots. It feels like this game plays it by the numbers, so to speak, but it’s also clear NetEnt put a lot of care and effort into making it look and play great. While we doubt people will fall head over heels to clone it like Gonzo’s Quest and Starburst, it’s still a rather enjoyable but simple game. If you like a lower amount of special features, this may be the slot for you.